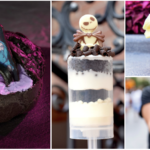 Ok folks, get those cameras ready, because Magic Kingdom is about to debut some Instagram worthy treats you won’t want to pass up. With Mardi Gras and St. Patrick’s Day around the corner, this spring will be full of colorful snacks and goodies you have to try. 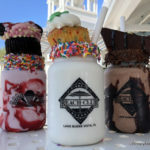 The Disney Parks Blog has offered a sneak peek as some of the deliciousness that’s coming to Magic Kingdom this spring. Guests will be able sample the new treats starting February 24th. All of these desserts will be available starting on March 1. 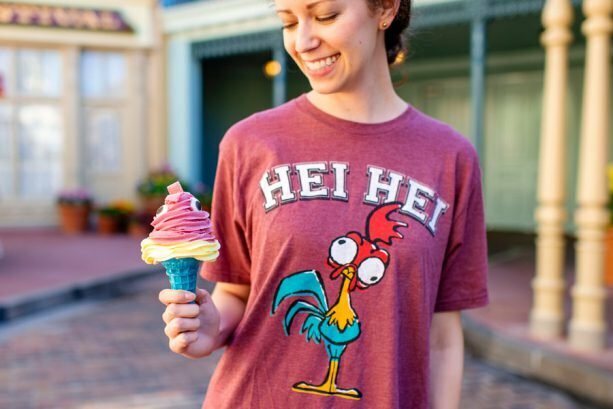 Hei Hei Cone – A blue sugar cone topped with raspberry soft-serve, pineapple Dole Whip, sugar eyes, and sour candy. 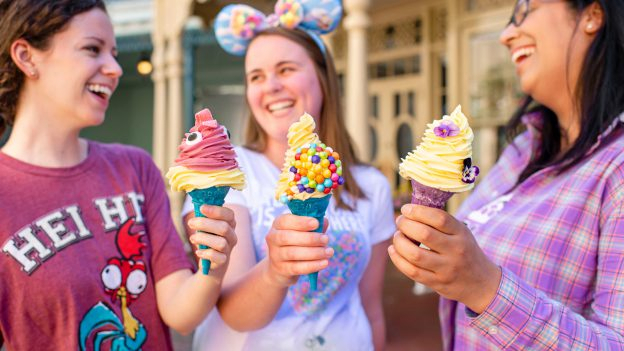 The Lost Princess Cone – A purple cone topped with lemon soft-serve and a beautiful display of edible flowers. “Adventure is Out There” Cone – A blue sugar cone topped with mango soft-serve and a candy balloon piece. This delightful treat is available at Auntie Gravity’s Galactic Goodies in Tomorrowland. 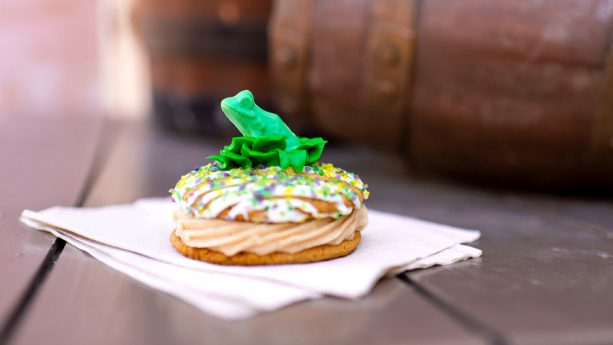 For a limited time, guests can stop by Liberty Square Market to indulge in the Frog Prince Whoopie Pie. Frog Prince Whoopie Pie – Cinnamon whoopie pie comes with graham cracker icing, sprinkles, and a chocolate frog. At Casey’s Corner, hot dog-lovers will love March’s Hot Dog of the Month – Casey’s Corned Beef Hash Dog. 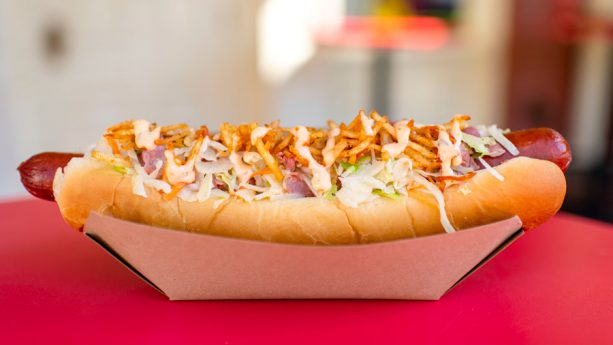 Corned Beef Hash Dog – Topped with crispy potatoes, corned beef, cabbage, and a Blarney sauce drizzle. 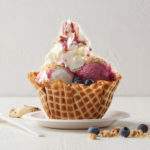 There are also a few new treats joining the party for Mickey and Minnie’s Surprise Celebration, like the Mickey and Minnie Waffle Sundae at Sleepy Hollow. 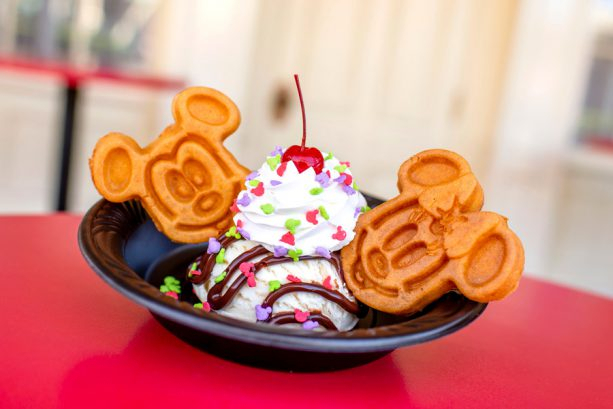 Mickey and Minnie Waffle Sundae – Mickey and Minnie-shaped waffles and a scoop of vanilla ice cream topped with chocolate sauce, whipped cream, sprinkles, and a cherry. 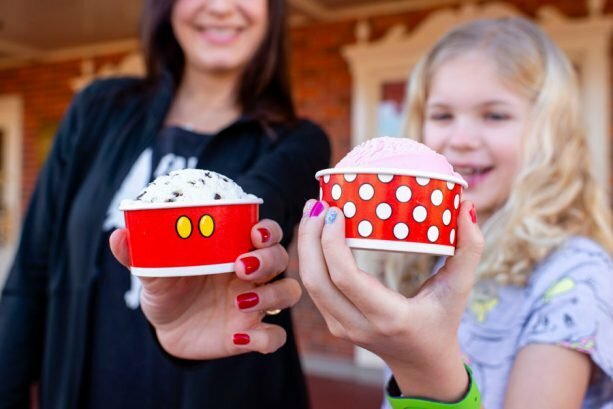 Minnie Mouse-themed sundaes will also be available at Plaza Ice Cream Parlor. Minnie Sundae – Two scoops of ice cream topped with chocolate sauce, whipped cream, strawberries, chocolate cream cookies, and a chocolate Minnie bow. Main Street Split – Ice-cream and a banana topped with strawberry and pineapple sauces, hot fudge, chocolate cream cookies, and a chocolate Minnie bow. Columbia Harbour House and Tony’s Town Square Restaurant, will serve Mickey and Minnie Whoopie Pies. 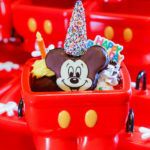 Mickey and Minnie Whoopie Pies – Red velvet whoopie pies come filled with cream cheese icing and are topped with chocolate decorations. Tortuga Tavern will feature the fun and colorful Mickey Confetti Pretzel. Mickey Confetti Pretzel – Dipped in marshmallow fluff and topped with confetti sprinkles.